This is a step-by-step Recipe for making at home crispy and tasty authentic Maharashtrian Style Split Green Gram or Moong Dal Chakli for snacks or for the annual Diwal Faral. The Moong Dal Chakli is easy to prepare, once you have all the ingredients in place. Wash the Moong Dal and add two Katori Water, Turmeric Powder, Hing and keep it in the pressure cooker vessel. Then, wrap the Maida, loosely in a thin piece of cloth and keep it on the upper plate of the pressure cooker. Cook the Moong Dal and Maida togeather in the pressure cooker for about 12-15 minutes. After opening the cooker, add the Ajwain, Sesame Seeds, Red Chili Powder and Salt to the Moong Dal and mix it thoroughly. Break the chunks of the Maida and filter it through a strainer. Mix the Moong Dal Mixture and Maida to prepare a thick dough. If you feel that the dough is loose, then mix the required quantity of Rice Flour to make it thick. 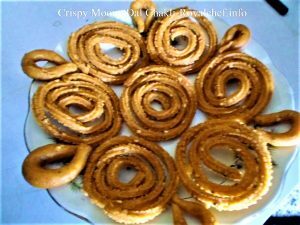 Insert the dough in a Chakli Maker and prepare the Chaklis and keep them on a plastic paper. Deep-fry the Chaklis in the hot Oil and remove them when they turn golden brown and crispy. 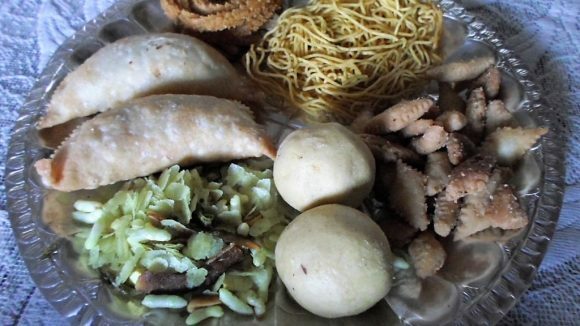 After the Chaklis cool down, store them in a plastic bag and keep the bag in an air-tight container.